Azabu University (AU) hosted the Ohio State University (OSU) Study Abroad Program on May 23-24, 2018. Led by Prof. Motomu Ibaraki, a total of 20 OSU students visited Azabu University for a two whole day learning program in public health. They were given lectures on the Diseases of horses, Schistosomiasis in Japan, and Control of insect pest in the aftermath of tsunami by Drs. Ishihara, Ooi and Nihei from AU, respectively. 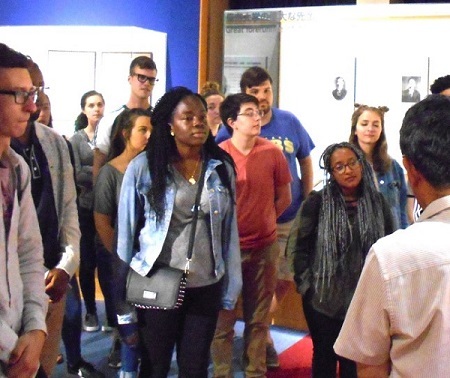 After lunch break, the OSU students visited the Life Museum in the campus, where Dr. Takatsuki gave a briefing on the museum exhibits. At the museum, the students were very impressed by the exhibits, especially the bones exhibits that reflects the evolution of the limbs to adapt to the motility of the various animals. The students also praised the layout of the exhibits which was considered very informative. The excitement of touching real bones at the hands-on corner and the observation of the detailed texture of the plastic castings of organic networks were some of the memorable experiences for the students. The exhibits of the historical figures of the university also convey a message of determination to restart our school after the destruction of the Second World War, for the American students. The students also gave accolade to the museum by saying that for a small university like Azabu, the museum makes it stand out. One student would also like to know more information on how the local students use the museum for their studies. This is one issue that the museum needs to look into. All the students gave an excellent A for the museum. After the visit to the museum, the students were give a bacteriology practical class by Drs. Kato and Okatani from AU. The following morning, a mini-symposium, on the difference and similarity in life-style and other social issues between USA and Japan, was carried out by OSU students and Azabu Univ. students. Dr. Lynch Jonathan from AU coordinated the symposium. Later in the afternoon, the OSU students participated in a veterinary parasitology practical, in which they dissected fresh mackerel to search for anisakid and cestode worms. The practical class was conducted by Drs. Kawakami, Taira and Ooi from AU. 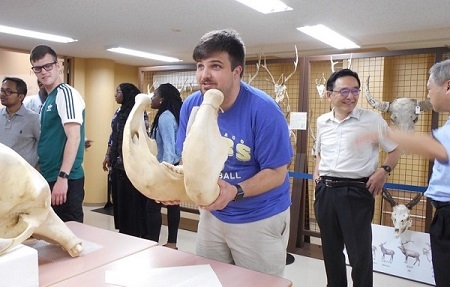 A student lifting the elephant mandible at the "Hands-on Room" of the Life Museum of Azabu University. Students of Ohio State University listening to the interpretation on the history of Azabu University. Ohio State Univ. 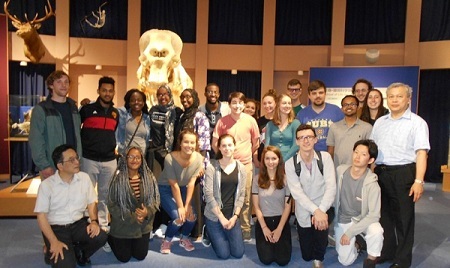 students at the Life Museum in the campus. Copyright © 2007-2016 Azabu University. All Rights Reserved.